The new workplace review is starting to pick up speed now. I had, what they call a “Work Style Assessment” on Friday. That, basically was to a document that formally set out how each one of us will contribute to making the best use of the available desk space. It seems that at any one time, at least 28% of the office desks are not in use; people at meetings, training, sick etc etc. we have a program called “Changing the Workplace” which is trying to maximise the available office space to save money. Mine worked out very well for me. It means that one day a week, I’ll work from a satellite office, one day a week from home, leaving three days a week working from my base office. This, of course is to be more flexible than rigid. It might mean that sometimes, I do two days in the main office and two days in another office, it depends on what work I’m covering. It was what I was looking for and it seem to fit in with what the service requires. 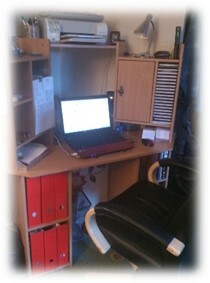 However, formalising the “Working from Home” part, means that I need to have either an office or a proper work station. When I have randomly worked from home, I’ve sat at the dining room table. That is not going to be allowed, which I kind of expected. So yesterday, I set about tidying up my computer desk, clearing out some of the rubbish and making it more of a computer work station than it was. So it should be okay now. All I need to do, when I’m working is to move my personal laptop and slot in the works one. Of course, the ‘moaners’ are still finding things to moan about: the expense; the inconvenience; the increased travel; earlier rising; getting home later; unsettling, there seems to be no end to the excuses why this is not a good thing. Those people should take a good long look at their conditions of service. It is all explained there, and before they go running off to their respected Trades Union, they should be aware, that the Unions signed up to this from the very start! We have an ‘Away Day’ on the 7th, where we should learn a lot more about what is happening. Well it started off as a day when we get to meet our new colleagues and get to know a bit about them. However it seems that it is going to be a ‘bonding session’ and a ‘workshop’. Neither of which, is what I was expecting. I have also heard that our team will be “absorbed” into the service the following week, but that’s only a rumour, so I’m not sure how accurate it is. Still I accept that it is a worrying time for some people, who have never been outside their comfort zone. Me, I’m just going to get on with it. As I mentioned before, we have no choice, and at the end of the day we still have a job. The bigger worry will be when the new structure is formalised and we have to start applying for our jobs.